So movie award season is over! Finally right? It all came to a pulsating end on Sunday 24th Feb via the red carpet extravaganza show that is the Oscars. Furthermore this year Oscars has seen a dramatic rise in “Oscar” talk via social networks, predominantly Facebook and Twitter. 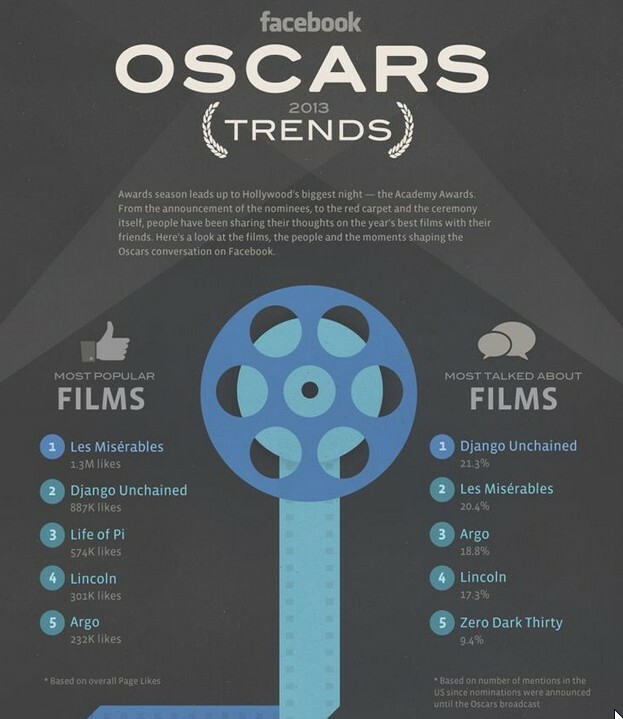 During the Oscars there were 66.6 million Facebook interactions regarding the live televised show. As an anticipated the tweets started as soon as the first celebrity set foot on the red carpet with 2.1 million tweets, generally judging which celebrities passed the extremely high fashion test. A further 6.8 million tweets were sent out during the show with considerable recognition for both Adele’s performance of SkyFall and ultimate Oscar win. Another big Twitter hit was winner of best picture “Argo” scooping up 85,300 tweets per minute whilst mentions on Facebook soared by 2,460%. The shows host and Family Guy creator Seth MacFarlane received a mixed bag of reviews via Twitter, however Celeb friends jumped to his defence on the back of a mauling from disgruntled fans. Every year the Oscars gets bigger and better and is attracting segments of the market like never before ultimately by this social surge. Hollywood is laughing all the way to the bank followed closely by Facebook and Twitter.